MOSCOW, Russia -- Vladimir Putin has turned the idea of fascism into a political tool, and now Russian historians are adapting to the Kremlin line. 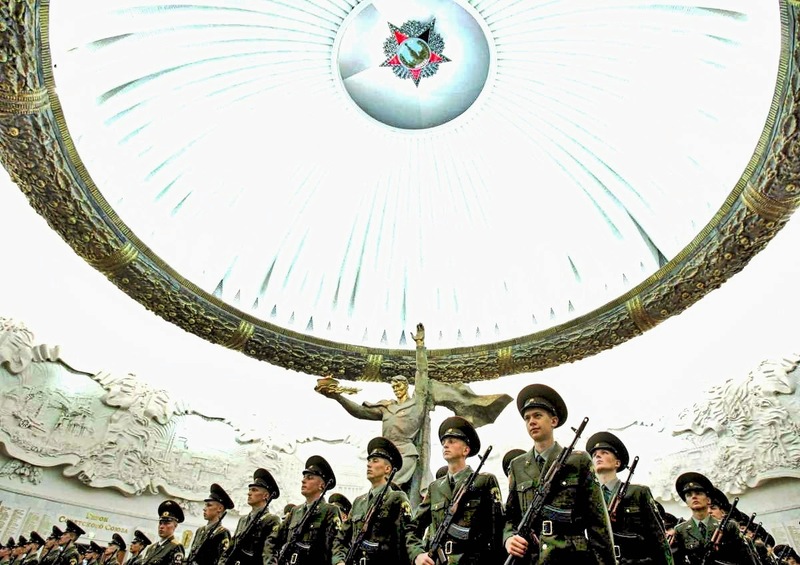 Russian soldiers stand in formation as they swear an oath at the World War Two museum on Poklonnaya Gora in Victory Park, Moscow. The trio of German historians, as well as a handful of their colleagues from Eastern Europe, flew into Moscow last week for what they thought would be a conference on the history of Nazi war crimes. It was the fifth in a series of international summits held every other year since 2006, first in Berlin and Cologne, then in Slovakia and Belarus, to keep alive the memory of the towns and villages destroyed during World War II. But the German co-chairman of the conference, Sven Borsche, began to feel that something was amiss in Moscow as soon as he met his Russian hosts. “All they wanted to talk about was the conflict in Ukraine,” he says. Even without the simultaneous translations provided for the foreign guests, they would have gotten the political message. The photographs shown by several of the Russian speakers put the atrocities of the Nazi SS right alongside pictures from the current war in eastern Ukraine. There is not much difference, the Russian historians suggested, between the actions of the Ukrainian military in its war against separatist rebels and the atrocities that Hitler’s forces committed during World War II. “Right now, fascism is again raising its head,” declared Yaroslav Trifankov, a senior researcher at the state historical museum in the Russian region of Bryansk, which borders Ukraine. This rhetoric—calling it an argument would overstate its relation to facts—has recently come into vogue among Russian historians. Under their interpretation of history, the struggle that began with the German invasion of the Soviet Union in 1941 continues for Russia today, in a direct line through the generations, with the conflict in Ukraine. That is the connection President Vladimir Putin first presented to the Russian people in March, when he sent his troops to invade and annex the Ukrainian region of Crimea. Ukraine’s ensuing war to prevent Russia from seizing any more of its territory has likewise been branded a fascist campaign against ethnic Russians. Practically every arm of the Russian state, from the education system to the national police, has since taken up this message. The state media have consistently painted Ukrainian authorities as “fascists” in the service of the U.S. government. In late September, Russia’s main investigative body even opened a criminal probe accusing Ukraine’s leaders of committing “genocide” against ethnic Russians in eastern Ukraine. But the more recent involvement of the nation’s historians has marked a worrying turn in this endeavor. It suggests a willingness to reinterpret even the most sacred chapters of Russian history, as the venue for last week’s conference seemed to suggest. With the exception of the Kremlin’s gilded halls and, perhaps, the nearby tombs of Soviet leaders on Red Square, few places in the Russian capital inspire such awed respect among the locals as the Central Museum to the Great Patriotic War. The vast rotunda, done up in marble and gold, would be something like the Temple Mount if Russian patriotism were a religion, while the official history of World War II that the museum embodies would be at least a portion of its scripture. By various official estimates, between 20 million and 30 million Soviet citizens died during the war against German fascists – more deaths than any single nation suffered in World War II – and the history of Soviet valor in that war still lies at the core of Russia’s sense of identity. But it has, like any dogma, proven malleable in the mouths of its contemporary preachers. “Nazism is again coming to us from Europe,” says Mikhail Myagkov, one of Russia’s leading historians of the Second World War and a professor of history at the prestigious Moscow State Institute of International Relations, where most of Russia’s top diplomats are educated. “The bacilli of Nazism have not been destroyed. Unfortunately, they have infected, among other countries, our brotherly nation of Ukraine,” he told a press briefing on the eve of the conference at the museum on Poklonnaya Gora. The following day, in one of its auditoriums, Russian historians took the stage one after the other to draw an explicit link between the Hitler’s Reich and today’s Ukraine. None of them mentioned Russia’s military support for the rebels in eastern Ukraine or the encouragement they got from Russia in rising up against the government in Kiev this spring. Nor did the speakers dwell on the fact that the far right is hardly the driving force of Ukrainian politics. The country’s new President Petro Poroshenko is a liberal Westernizer with no links to Ukrainian nationalist parties, and the supposed popularity of those parties in Ukraine was exposed this week as a Russian fabrication; in the parliamentary elections held on Oct. 26, they failed to win a single seat in the legislature. But from the speeches presented at the conference in Moscow, one would assume that Poroshenko and his allies are all just resurrected Nazis in disguise. As these speeches were translated for the foreign delegates, including guests from the Czech Republic and Slovakia, their faces turned gradually from confusion to disgust. Joerg Morre, the director of Berlin’s Karlhorst Museum, which focuses on the history of the eastern front in World War II, began to fidget in his seat. Borsche, the co-chairman, agreed with him: “It’s polemical!” he said. As the conference drew to a close, the two of them decided to voice their objections. Morre, springing from his seat, took hold of the microphone and told the hall that he did not agree with the final declaration of the conference, which had been written by its Russian organizers. Specifically, he took issue with the clause that declared, “Our generation is facing the task to deter [the] revival of Fascism and Nazism,” a thinly veiled reference to Ukraine, the German delegates felt. “It has become clear that we have different views on what fascism means today,” Morre told the hall in nearly perfect Russian. “Your point of view is not mine. So I call for this part of the resolution to be removed,” he added. After some noisy debate, the delegates agreed to put the matter to a vote. Practically all of the foreign participants raised their hands in favor of deleting the reference to a “revival” of European fascism. All of the Russian participants, including a large group of high school students who had been herded into the auditorium about 15 minutes earlier, had the clear majority in voting to leave the text of the declaration unchanged. So the hosts of the conference won out—a small but telling victory for the cause of Russian revisionism. Outside the hall, Borsche seemed at a loss for words as he waited in the coat-check line. He had served as one of the initiators of the conference and its co-chairman, flying in from Germany for the occasion to discuss a shared history of suffering during World War II. But he says he had no idea that his Russian colleagues would use it as a chance to promote their political agenda against Ukraine. “That’s not correct,” he told me. And as Russia sets out to redefine what Nazism means, it is a problem that Western historians will somehow have to face. I don't think they're rewriting anything. I see most of the same things in Ukraine I have seen in historical media from the 1930s. Hitler used certain groups to help him gain power then enlisted them in his causes and ultimately in warfare. Not only is it a very similar pattern being used by the west and Kiev it's a common system used throughout history.